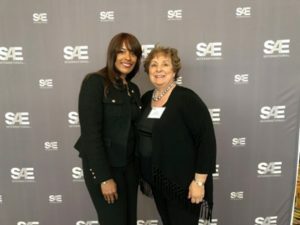 Thomas Built Buses VP Honored for Engineering Excellence | Sonny Merryman Inc.
Leslie Kilgore (left) of Thomas Built Buses was honored by SAE International with an engineering award named for Rodica Baranescu (right). HIGH POINT, N.C. — A Thomas Built Buses executive was recognized on Tuesday for her leadership and her technical contributions to the automotive industry. Leslie Kilgore, vice president of engineering for Thomas Built Buses, was honored with the prestigious Rodica Baranescu Award for Technical and Leadership Excellence in Automotive Engineering by SAE International (formerly the Society of Automotive Engineers). The award honors and celebrates the successes of women in the engineering profession and their contributions as leaders and technicians in commercial engineering. Three women are honored with this award every year: one each from the aerospace, automotive, and commercial vehicle sectors. Kilgore received the award for the automotive sector. Kilgore joined Thomas Built Buses in 2016. One of her most notable accomplishments to date has been leading the development of Jouley, Thomas Built’s first Saf-T-Liner C2 electric school bus. She is also working on new innovations under the BusWise Technologies umbrella, designed to make school buses safer, easier to maintain, and more efficient. Kilgore holds a Bachelor of Science degree in mechanical engineering from Michigan Technological University, a Master of Science in mechanical engineering from Purdue University – West Lafayette, and a Global Business certificate from Thunderbird School of Global Management. She is completing a Master of Public Administration in Public Policy degree from the University of Southern California – Los Angeles. Kilgore is active in the community, serving on the board of directors of three nonprofits that serve underprivileged and at-risk youth. Her passion lies in mentoring young girls, from incarcerated youth to talented high school students, and she is tireless in her efforts to improve the community, according to Thomas Built Buses.